Spam's good for a lot of things: putting the special into House Special Fried Rice, making tomatoes taste better when in between some bread, or dicing up pieces to have in some home made mac n' cheese. "Cold or hot, Spam hits the spot" or so they say. But we all know you have to fry up spam for it to be a better tasting beast. Indeed, it was the home-made mac n' cheese we decided to make the night we opened up the black pepper spam. Much like the solid truth printed on the can, the solid truth that comes out of the can is pretty impressive too. Maybe it's not so solid if you were to poke your finger into it (hey, you guys do that too, right?) but it certainly is all sorts of dense, smeat madness when it slowly falls out of the can. I have no problem with the glorious, unearthly pink that is spam. However, that pink is not the kind I'd like to wear on a shirt outside and the gelatinous, texture of spam is the sort of off-putting thing that some probably don't want to put in their insides. What I did have a problem with though was the look of this particular spam. Speckled with black pepper made it visually less appealing to me. But more so, just by looking at it I knew exactly what to expect when eating it. There's nothing too shocking about it but I'm sure if you've had spam before, you too would pretty much know what to expect here. All this is is a bunch of salt and black pepper that you can eat in block form. That's it. Paprika and thyme always gives the illusion of "better". Or something like that. The black pepper was so overwhelming that it did nothing to enhance or complement the mac n' cheese. The spam actually took flavour away from the sharp cheddar rue we had made. Not surprising was the fact that the black pepper spam excelled in a fried egg and cheese sandwich. Why wouldn't it? It's just like having salt and black pepper on your fried egg. Iced coffee in a glass bottle was made with love by Sister Z. 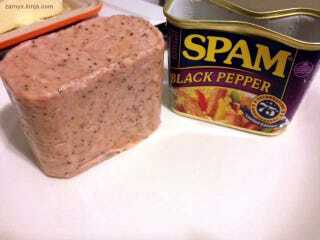 My verdict overall on the Limited Edition Black Pepper Spam? Yes, that is entirely harsh but I have no desire to have this again. I'll stick with my low sodium variety spam, thank you very much. *Disclaimer: A quick check of Wikipedia and the Internet's "never lie to me" policy, informs me that Spam was first created in 1937. Some quick math later and son of a ham! Actually, the can was bought last week. Year long celebrations are acceptable. Stop judging me even more so, you jerks! Eat ham, and jam and spam a lot over at TAY Classic, where the discussions about life, video games and whatever you fancy never expire. Did you still have questions on how TAY works? Fellow Killer Rabbit TheUnfathomableTruth found a guide on one of his murderous frenzies. Announcements: Did you remember to give us your friend code yet? Animal Crossing: New Leaf is just a few days away! It's not too late to join the TAY community in burninating the villagers and their thatched roofed cottages! Check this link for more info. We'll make sure it gets seen and added. If that's not your thing, we're sharing our IDs on other consoles too. Remember to: Check out the A Hat in Time Kickstarter. Doesn't hurt to take a look, right? See for yourself!